The biggest news coming from MWC happening now is from Samsung. 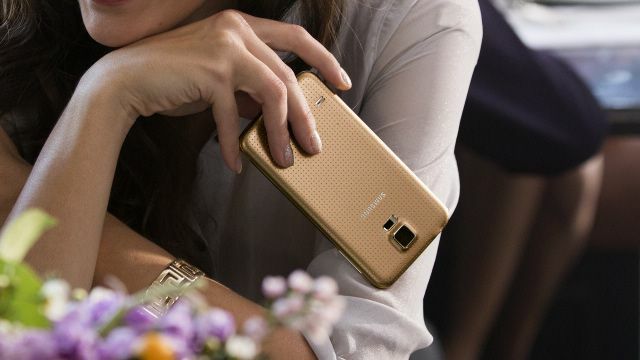 And it’s about their flagship product, the Samsung Galaxy S5. The new device will start selling on 11 April (yes Singapore included in the launch markets) although exact pricing and availability are still unknown. Pretty sure Singtel, Starhub and M1 will conduct their own launch events. If you wanted a radical new design, you might be out of luck as Samsung has kept to plastic as the basis. Also, the back of the phone is perforated to improve grip, which is a change from the faux leather that some people expected to be on the device. Guess it wasn’t too popular on the Galaxy Note 3. I personally don’t like the perforated look. Whether or not you think it looks good is up to you, but there are going to be four colors available at launch: Charcoal Black, Shimmery White, Electric Blue, and Copper Gold. Despite its familiar design, the GS5 has a few new useful hardware features, including a fingerprint scanner (Apple patent lawyers are probably getting ready their knives), heart rate sensor, and a toned-down TouchWiz UI on top of Android 4.4 KitKat. So what else is new here? Read on for a deeper dive. The new Galaxy retains the same 1080p Super AMOLED panel as the GS4; it’s just slightly larger, at 5.1 inches. With this in mind, it shouldn’t come as a surprise that the viewing experience is pretty much the same as its predecessor. Additionally, the GS5 comes with a swappable back cover, microSD slot and removable 2,800mAh battery, which has a higher capacity than last year’s model. It’s also IP67-certified, which adds an element of water and dust resistance. You can now take it for a swim, underwater photography / videography but not any deeper than 1m. The next major add-on is the fingerprint scanner. It works rather nicely. All you do is slide your finger over the home key for it to work. This added security, plus the convenience of it, is definitely a major plus for the phone. If you are one of those people who do not lock your phones, it is a big security risk. And this fingerprint sensor will come in handy. The phone also has a heartbeat sensor on the back right next to the LED flash. Its function is very straight-forward, and there will be plenty of third-party apps out there that will utilize it even more. But perhaps it would be more useful on the Samsung Gear and Samsung Fitbit clone which we will talk about shortly too. Personally, I thought Samsung was smart to focus on improving the camera function. There’s not much to innovate in terms of hardware specs, and other than improving screen size or battery life, no one really cares about how fast the processor is, how much RAM etc. However, increasingly, the number of people solely using the smartphone camera has greatly increased. And why not, especially with all the attention on social media integration. The S5 camera is a beautiful 16MP, and is claimed to have a 0.3 second autofocus time. It can record video up to 4K resolution at 30fps, and the camera has some nice software tricks as well, such as Selective Focus, which allows for users to decide what objects in a shot are sharp and which are blurry, creating some nice camera effects without expensive lenses. Well, since we are a tech blog, the S5 will feature the fastest processor in a phone today: the Qualcomm Snapdragon 801. This beast, clocking in at 2.5GHz, has Krait 400 cores that are 14% faster than the 800, an Adreno 330 graphics chip that can render 28% more effectively, and a dedicated camera chip that increases sensor processing speed by 45%. The phone also has support for LTE-A Cat4 multi-band high-speed, which allows for a maximum theoretical download speed of 150Mbps. One of the coolest features, in my humble opinion, is the Download Booster, which combines Wi-Fi/ac and LTE speeds to provide insanely fast download speeds, up to 650 Mbps. Sadly, Samsung opted to stick with TouchWiz for their UI, but this rendition of it has flatter and rounder icons alongside reworked menus. The decision of whether or not it is enjoyed will be dependent on the user. Samsung also introduced a Ultra Power Saving Mode that turns the phone black and white (the screen, I mean) and turns off all processes and connections that are unneeded. This should result in some massive battery saving in that state. The S5 is also the first smartphone to feature the Wi-Fi 2×2 Multiple Input Multiple Output (MIMO) setup, which brings the multiple antenna capabilities found in tablets and home wireless networks to phones for the first time. There you have it… a plethora of new features. Is it enough to get you to buy an S5, stand by for the price soon.